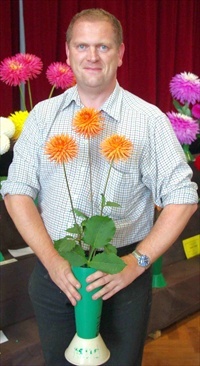 Midlands Society Chairman Ron Guest was a happy chap when the show started - with over 4 in rain in the previous week, he had been thinking that he would have to cancel the show! 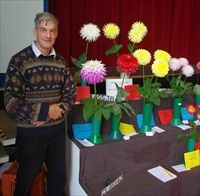 However 32 exhibitors took part showing 340 entries making for a very good show.. We had an increase in the number of visitors to the show as well..
Dave Gillam is the Midlands Champion for the second year running. 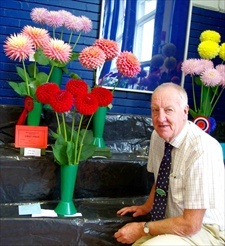 Dave also won the H Dunkley Trophy for the best vase of Poms in show and the George Irvine Perpetual Challenge Cup for winning class 14 His entry can be seen on the right. It was very nice to have the Irvine family at the show. 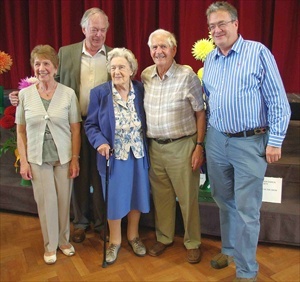 Here we can see Mrs Irvine with her sons - one has come over from Canada, and the Society President Les Jones and his wife Audrey. The judges for the show, ready for action!. 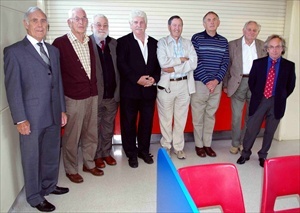 Many thanks to them for their time and effort - judging finished ahead of time. The society has a new Silver trophy! 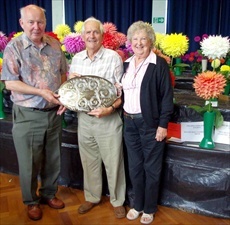 Tom Bebbington and his wife attended the show to donate a silver plate ( awarded by the NDS) to society president Les Jones. Tom was very impressed with the quality of giants at the show. 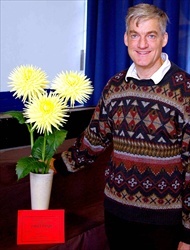 Tom was national champion and also won best exhibit in Harrogate in the past. He first won at the MDS show in 1973!. 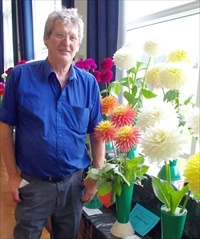 Ian Hill came down from Thirsk to show his Giant Dahlia - Jean Shaw, part of his winning entry for the Philip Damp Trophy. 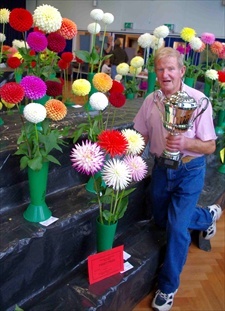 He was also awarded the George Woodfield Trophy for best Large / Giant Dec in show. 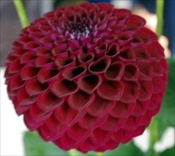 His other blooms were: Alf Ramsey, Alvas Supreme, Candle light, Kenora Valentine and Walter Hardisty. 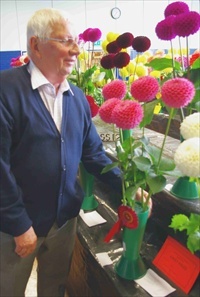 The '20 Blooms from 20 Varieties' class only had 3 entries this year, however local showman Gabby Hayes won the Bruce Watson Trophy..Les Jones was second with Tom Upton third - it was nice to see Tom, he has not showed here for some time. 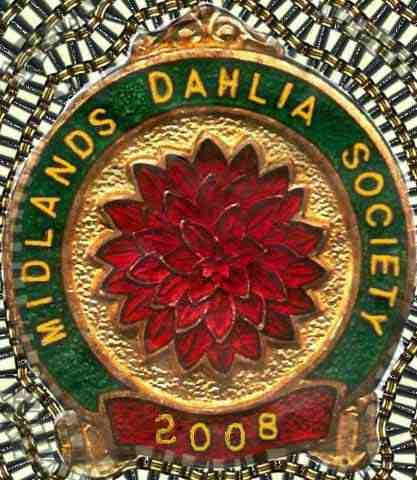 It's nice to have members who travel some distance to exhibit at the Midlands show. 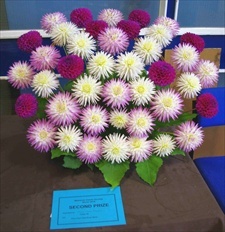 George Elliott from Swadlincote South Derbyshire came second in class 20 - one vase medium and one vase small dahlias. 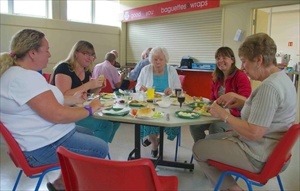 Thanks again to Bruce and his catering team - seen here enjoying their lunch. But - where's Bruce? 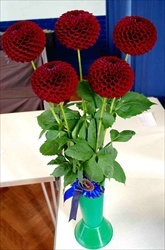 We also thank Ange for putting on bacon butties early on Saturday morning - much appreciated by those staging vases. 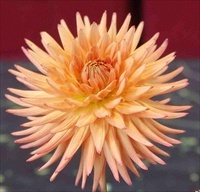 Mark Roberts wins the Midlands Dahlia Society Seedling Shield for Best Seedling exhibit, and Miniature Seedling Class winner with a beautiful, perfect cactus form orange min Cactus. It will be named 'Tom McClelland' after Tom. John Digweed came second with his new Min Ball - George Marston - this can be seen below. 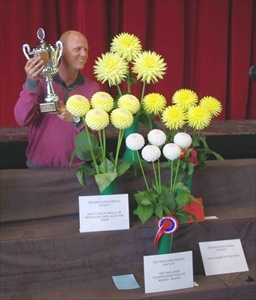 Popular showman Frank Taylor won The Pam Parsons Challenge Cup with two nice vases of Dikara Superb and Marston Lilac in class 12. 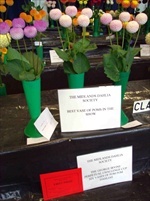 This was a popular class with 8 entries shown below, John Digweed was second and Frank Newberry third. 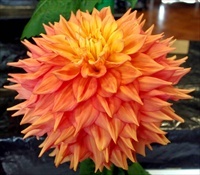 Rob Cheetham wins Best Exhibit in the Novice Section with Ruskin Sunshine in the Medium dahlia class. He also won in the Giant or Large class with Kenora Challenger. He wins the Don Brawn Trophy and a NDS Bronze Medal. 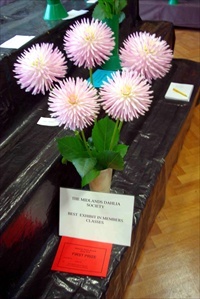 Paul Fulford won the Novice Small dahlia class with Barbarry Maverick. 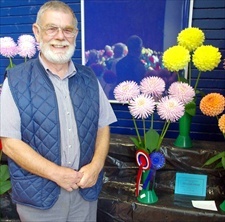 Paul excelled himself by also winning the Intermediate section 3 giant blooms showing Bryn Terfel. He won the 72 Trophy. No longer a novice Paul? Roger Turrell won class 2 - the Lady Godiva Trophy with a very good vase of Marion Storer, Grenidore Pastelle, Avoca Cheyenne and Kiwi Gloria. 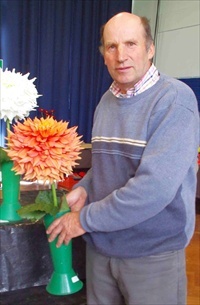 However Frank Bolsover who came second won the Cactus Cup, the Violet Davies Premier Award and the Edward Durrant Memorial Trophy for his vase of Kiwi Gloria. This was described as a beautiful, tremendous vase. No wonder Frank looks pleased with himself in the picture below! 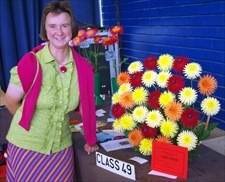 Marie Jane Roberts entry wins the Lilian Hall Rose Bowl for another year. Blooms include Weston Sprite, W Miss, W Pirate plus a seedling. Marston Lilac, Avon Snowflake and a seedling.